September 24, 2012 By arzea 40 Comments This post may contain affiliate links. Read my disclosure policy. I like peanut butter and I feel like most people generally do, too. My son is a HUGE fan of peanut butter, and recently I caught him trying to eat it straight out of the jar (See Exhibit A below). I usually buy the creamy kind with nothing added to it…just peanuts, and sometimes salt. I don’t really understand the point of all the additions most PB’s have, because it is so delicious already. Kroger actually has their own brand that is pretty good, with no added ingredients. 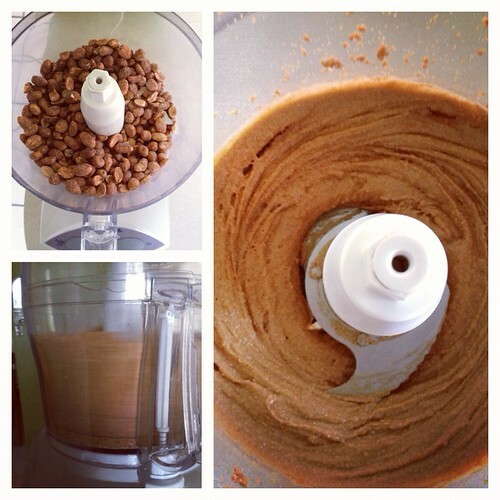 Anyway, I had been wanting to make homemade peanut butter for a while, and I found a great article on how to do it. Little did I know, I could just use my handy Food Processor to get the job done. Before reading the article, I would have thought that it would be necessary to add oil or something, to get the peanuts to turn into a creamy butter, but it’s not. You don’t have to add anything, which I love. The processor first grinds the peanuts up, and after a minute or so it forms a giant lump. Then, after this lump gets thrown around in there for a few minutes, it starts loosening up, and eventually turns into the creamiest peanut butter. For me, it took about 3 minutes from start to finish (but the article I read said 5 minutes, so it may vary on type of food processor). Naturally, the second my son spotted this peanut butter, he lost it. He had to have it, and was trying to reach a spoon into the food processor’s bowl and scoop it out. 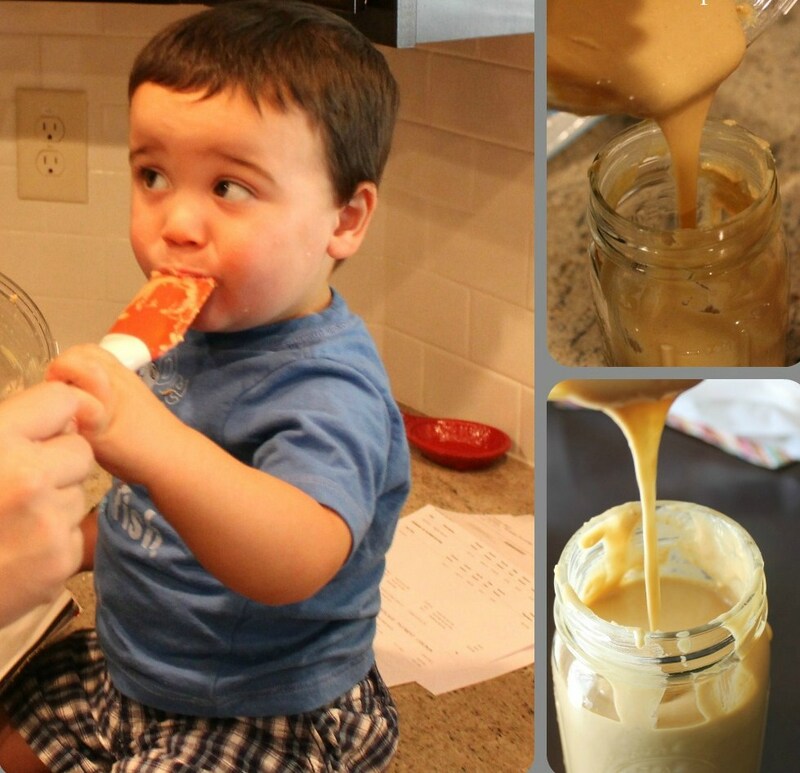 I used a spatula to get all the peanut butter out, and then let my little guy lick the extra peanut butter off the spatula (some kids like brownie batter, he likes PB!). He was in heaven! I put the peanut butter into a mason jar, and popped it in the fridge. It was very runny (and warm) right after i mixed it, but firmed up to a normal consistency after being cooled in the fridge. No oil has separated from the top either, which is cool….why does that happen on some types of peanut butter? This wasn’t really cheaper than buying it, but that’s okay with me. The nuts were under $4 at Trader Joe’s and that was it! Like Domestic Superhero on Facebook for more recipes, tips, and tricks! OMG! That is so funny! How did it turn out? What type of nuts did you use? 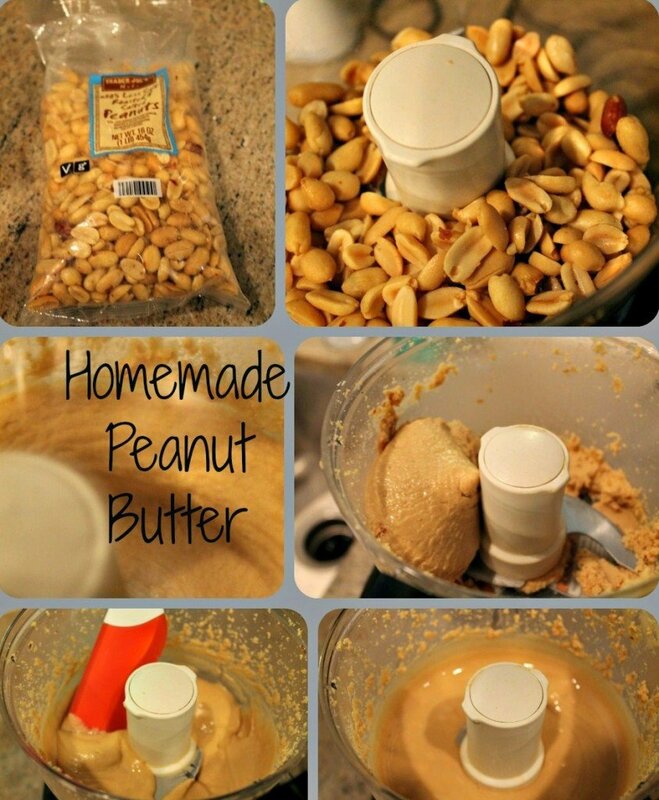 We used honey roasted peanuts.. It was good.. mine was stiffer looking than yours though. I stopped as soon as it started looking like peanut butter.. maybe about 7-8 mins..
Maybe next time try a little bit longer…it was crazy how loose it got after that thicker phase. I was actually shocked! I agree. I am actually not too disappointed with the thickness but I will probably leave let it run longer next time… Its spreadable but still kinda gritty. We made some almond butter a few months ago. It was delicious. The kids thought it was a little odd just because it wasn’t Jif but we loved it (and when we put it on their pbj’s they didn’t notice the difference!) Enjoy! Wow! Did you use unsalted peanuts? If so this has so gotta be better for all of us, rather than a lot of the bought PB with all sorts of additives. No, I did use salted nuts, to avoid adding salt. Next time I will try it with no salt, though. Delicious! i would need to cut that recipe in half. It is just the two of us, no kids yet. This was the whole bag of nuts, I had to do 2 batches (well i dont know if i had too, but the whole bag seemed like too much for the processor). But you should do it…it’s soooo delicious! Have to pin this. I thought you had to add oil. If you read labels they almost always have soy lecithin, my nemesis. So this sounds like I should be making this. Thanks so much. I was under the same impression! It is really hard to find peanut butter that isn’t full of additives, which is totally unnecessary. You don’t have to add ANYTHING when you make your own. It will look like the peanuts are turning into a big dry glob in the processor, but then magically the oils break out of the glob and it smooths out. It’s really cool to watch! 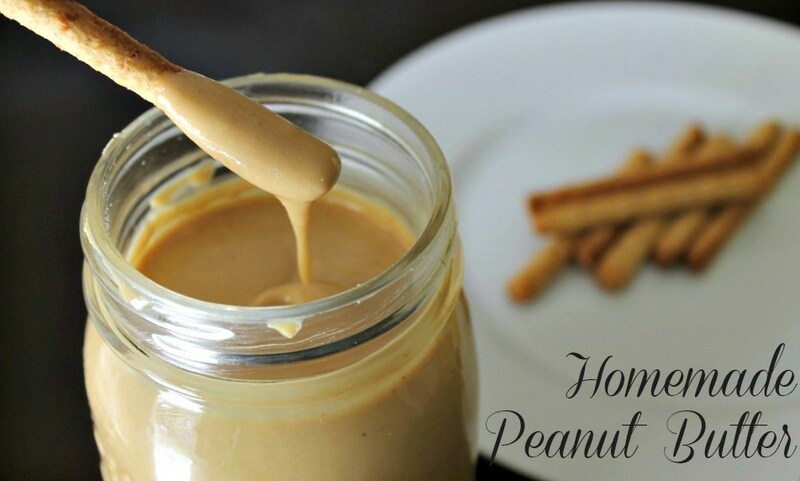 You can add salt if you like salt in your peanut butter, or you can use lightly salted nuts. I have tried both and both turn out good. 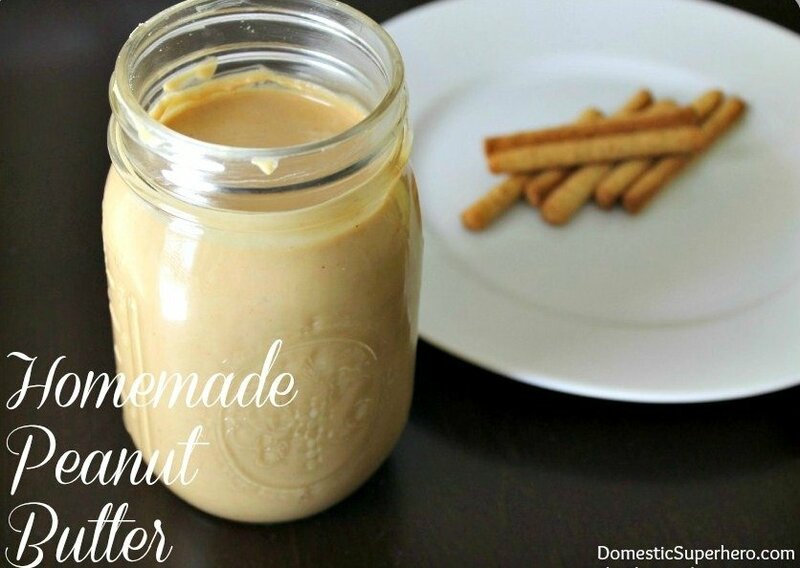 This can be done with all other nuts too, so the nut butter options are endless! I am not sure..I keep mine in the fridge because there aren’t any preservatives in it…but I don’t think you really need to. Paula, thanks for taking the time to write your comment! 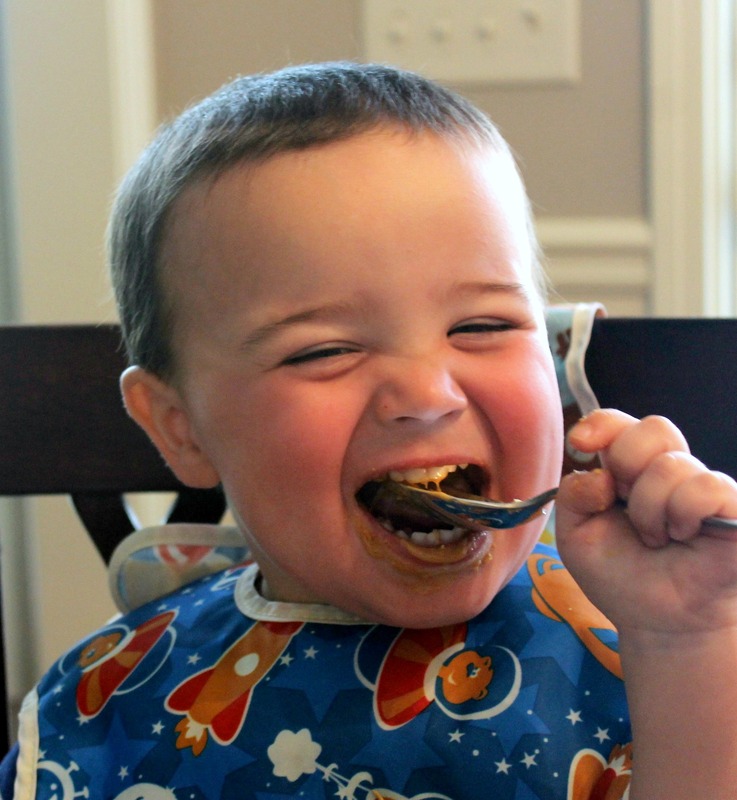 I am so happy you liked the Peanut Butter…it really is so easy and healthy! I wish more people would take the time to try it out because it’s really NOT HARD! And it’s way better for you than the store bought alternative! 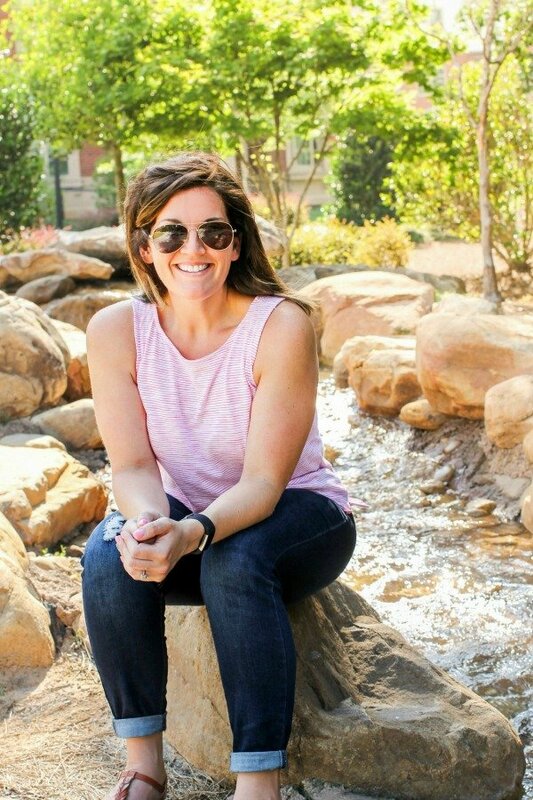 Your protein shake sounds delicious, and I am definitely taking note so I can try it out! Thanks for stopping by!! If you are buying your nuts at Trader Joe’s, pick up a jar of his “cookie butter”. Oh darn ! it’s good. 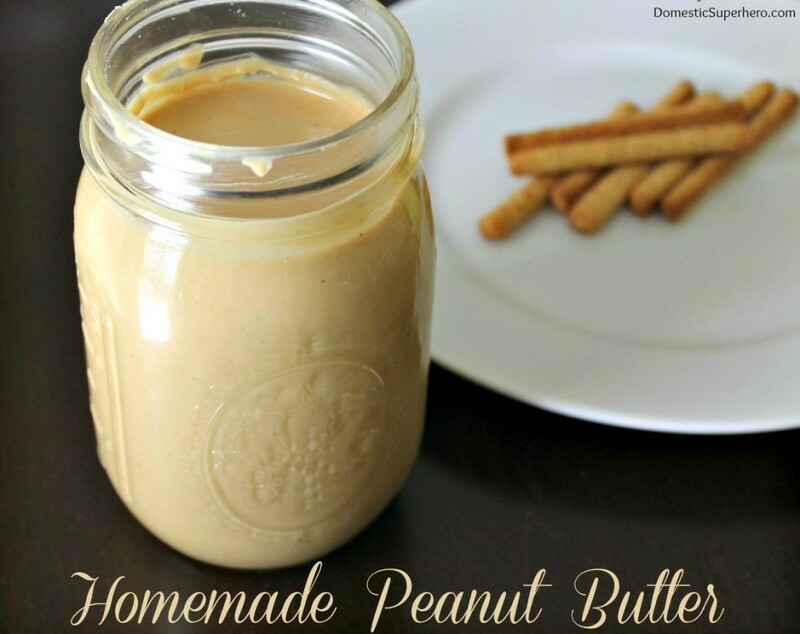 Since home made PB is not homogenized it is natural for the oil to separate. Refrigerating it will stop the separation, but then you lose some flavor. I eat PB out of the jar with a spoon too. I have had Speculoos Spread which is the original cookie butter from Belgium! My Belgian friend introduced me to it long ago, but it;s way too sweet for me. I diidn’t have an issue with it separating at all actually, but it’s delicious regardless 🙂 Thanks for stopping by! That sounds/looks delicious! My daughter buys organic peanut butter for herself and her dog, but it gets so expensive and it separates. I’m thinking they add oil in the processing. I would love to make unsalted peanut butter for myself as I can’t have too much salt. I am going to try this next time I get the chance! It’s so easy and healthy! Let me know how you like it!